I have been wanting to learn to play a musical instrument for a long time. I tried piano, guitar and something else I cannot even remember when I was a teenager and I love all them, but nothing stuck because I did not commit enough time to practice, and all those classic excuses. 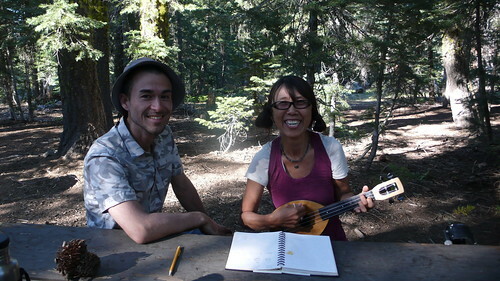 When I go to our mountain cabin in North Fork, California (near Yosemite National Park) I meet a lot of people who play music, and the ukelele caught my eye. 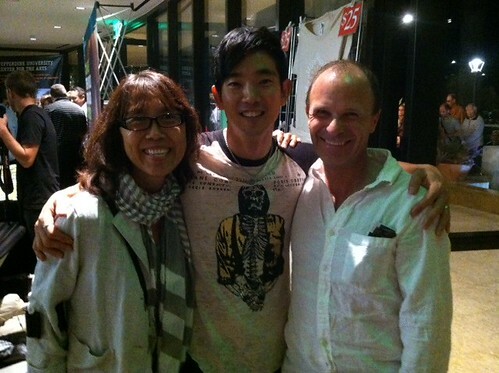 The first time I really appreciated how beautiful the ukulele can sound is when we met Jake Shimabukuro, a famous ukulele virtuoso and composer, through our friend about 6 years ago. The ukelele sounds so soothing and transports me to Hawaii. I used to think the ukulele was just Hawaiian music played by people in Hawaii. I found out it knows no borders. I went to the French Meadows Macrobiotic Summer Camp last year for the first time, where I met many people who play music. I knew it was a sign for me to at least try something. This year was the year I will be transformed by music (the last year was transformed by miracle 11miles hikes (check my blog from http://studiomugen.blogspot.com/2012/07/amazing-french-meadow-macrobiotic-camp_27.html ). 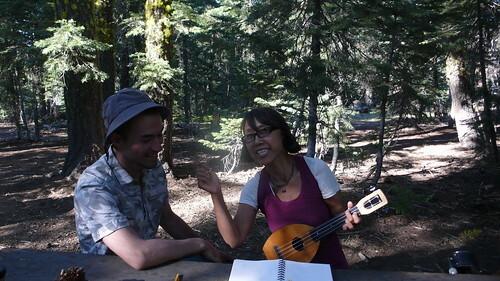 I know I am not going to play like Jake, but I really wanted to try so here is my first Ukelele lesson with Jason Taiyo King who was at the French Meadows Macrobiotic Summer Camp. 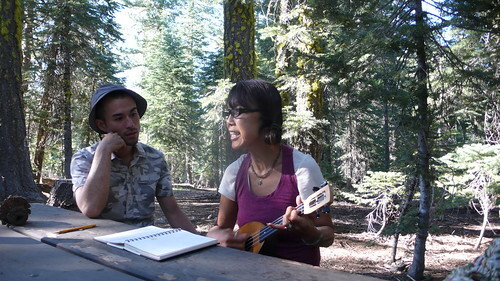 After I came back from the camp I told my husband Eric about it, and he told me to look for an ukulele asap so I would not lose the momentum. 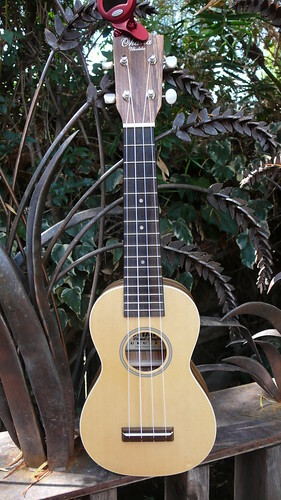 Here is my own first Ukelele. I can't believe it! I am practicing 5~10 minutes every day. I can bring it almost everywhere since it is a small enough. I have a long way to go, but at least I am having fun, and I may even be good enough to play something next year at French Meadows Camp. If anybody wants to learn ukulele with me, let me know. 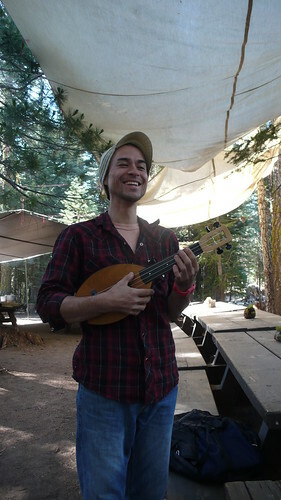 I will create a ukulele Meetup in Venice beach Seed Kitchen, so let's play together!! Hope you liked what Alan Kenny wrote on our last blog. I really appreciate him to write his experience about our Umeboshi Plums at Seed Kithcen. Also post his photos. If any of you are interested to purchase our Umeboshi Plums we will be able to ship them in the U.S. so please contact seedkitchen@gmail.com. We received a question about Green Remedy Drink that Alan mentioned. Here is the information and how to make it. Green remedy drink is a good for detoxing liver. 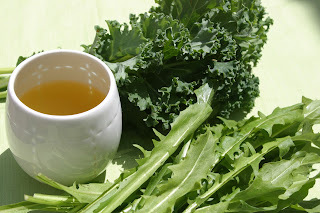 Using large leafy greens like; kale, collards, dandelion, daikon or turnip leaves, or Chinese cabbage. Very finely chop two or three kinds of large, leafy green vegetables. Add twice the amount of cold water. Bring to a gentle boil and simmer for 3 to 5 minutes. Strain out the solid vegetables. Add a pinch of sea salt or a few drops of shoyu/soy sauce or tamari for people do not use a wheat/gluten toward the end of simmering and stir. Drink hot or at room temperature. How much and how often to drink this remedy drink changes depend on your conditions so I recommend you to talk to your macrobiotic counselor (if you don't have one...find your right counselor) and get details. I am available to offer the counseling in person, phone or Skype. Hope you like this in formation!!! My name is Alan Kenney and I am a macrobiotic counseling client with Sanae Suzuki. I was talking with Sanae about an experience I had with fresh, whole food versus packaged foods and she asked me to share this experience on her blog. First, I have been using umeboshi plum in my recipes for a long time. However at the beginning of the year I was attending a cooking class with Sanae at Studio Mugen. Sanae talked about being able to provide 10-years-aged umeboshi plums harvested from a friend’s orchard. I started using these plums and have been using them. I found they are very delicious. A couple of weeks ago I ran out of umeboshi plums and decided to get some from the store. I was preparing a recipe and I tasted one of the store-bought plums, and I was surprised at how it tasted like boring, tasteless paste. I was so surprised. I also was thankful for the reminder of how important it is to use fresh, energy filled foods which are reflected by such things as vibrancy of taste. I also marveled at how the 10-year aged plums even have what I call a tasty umeboshi “honey” that drizzles from the fresh plums. I’m so glad to have gotten a fresh supply of umeboshi plums and to treat my tongue to such a great taste. In the same vein as the umeboshi plums, I remembered that I always make fresh gomashio condiment. But, several months ago I bought a prepackaged bottle of gomashio since I had run out and thought it would save me time from making another fresh batch. The moment I opened the container I knew I made a mistake. When I make homemade gomashio it has a great sesame fragrance which always greets my nose when I opened the container so I could put some on my brown rice. However, the store bought, packaged gomashio had no fragrance, no scent whatsoever. Also, the packaged gomashio didn’t have the powerful taste and feel of freshly roasted gomashio. Again, the experience reminded me of the power of fresh foods as experienced through taste and fragrance. One last example about the power of food. Sanae had instructed me to make and consume a greens drink for detoxification. I started making the drink according to her instructions. However, I found out that I had been not carrying out the instructions incorrectly. I figured this out when I attended a macrobiotic healthy cooking class with Sanae. At the class she showed how to make the remedy. I consumed it and had some fantastic results that day. I didn’t have the same results the way I prepared it. I was thankful to learn how to create this detox remedy and to benefit from it. Again, the results I experienced after preparing the food correctly showed me how powerful the energy of food is to help in my efforts for better health. A lesson I continue to learn by attending classes at Studio Mugen and Seed restaurant is that there is always room for improvement and growing in my understanding of the energy and power of food for healing and health. I have worked hard in my own personal cooking and studying of books to have a greater understanding of macrobiotic cooking. However, by attending the various cooking classes and macrobiotic support meetings given by Sanae, I continue to pick up finer points of understanding of food or health and healing. Having said that, I encourage everyone who is interested in having the best health for your life to look into the various opportunities to gather at Studio Mugen or Seed restaurant. 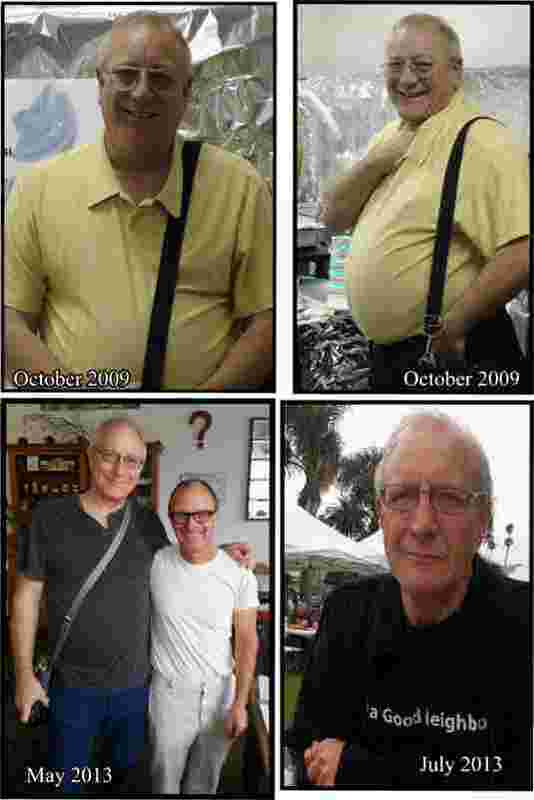 Just to show you how I have benefitted from my macrobiotic experience I have included comparison photos of myself. The top photos (in yellow shirt) are from October 2009 just before I stated my macrobiotic journey. The bottom photos are current.